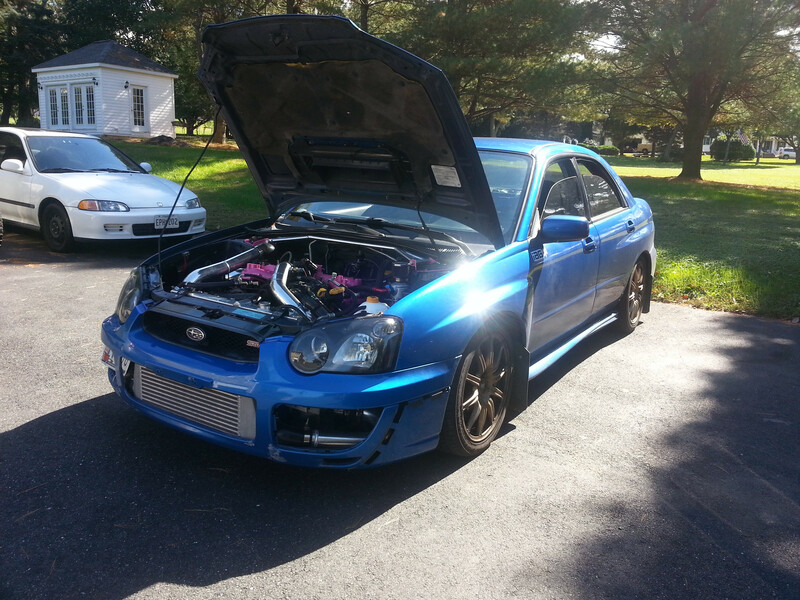 Well, as much as i do not wanna do this, im putting up my 04 STi for sale so i can relocate halfway across the country... ill start by saying it is about 85% of the way done in my eyes. It is AP speed density tuned on 93oct pump by Cleo @ iAG performance. 171xxx on body // 7k mi on shortblock // 90k mi on heads (inspected at sb build and looked excellent) // extra 06' STi shortblock incl. 60k mi in working condition** //1000mi on turbo setup since tune, this will rise slightly as i wait for it to sell. 06 WRX EJ255 - Stock D25 heads / Artie @ iAG built shortblock 8.2:1 comp. Cobb AP v2 Speed Density tune @ iAG Performance w/ Cleo (93oct) 400/364 @ 22psi on dyno - builds 23psi on the street so maybe 400/375 on the street? -Drive & Enjoy... lol duh. before i sell it, i will be replacing the power steering pump, and also charging the a/c... yes thats right, it has A/C ! Im asking $15.5k FIRM - please keep in mind i have just put about $3k more than this much into the car, not including the shortblock build, motor drop, the tuning, OR the actual car itself lol... i have receipts for everything from going rotated. Last edited by 06rexLTD; 10-23-2014 at 10:24 AM. Bump for a Nice Ride! Man I wish You didnt have to let her go! GLWS someone is about to be very happy! thanks homie - yea i really wanna see her with meth, and i was going to wrap it for dirt cheap, my friends dad owns a vinyl place (650 full wrap with cf roof !) however, moving west is what i must do at this time. hopefully i can get it gone before i have to leave to make things easier. Well i have been changing the coil packs on this due to a cyl 3 misfire i was having, im thinking now that the plugs are fowled out maybe because cyl 1 (same side both passenger) was misfiring last night and i changed that pack as well.. on the way to work today it decided to start tapping a bit then it quit on me.. havent had a chance to get it home and look at it due to having to be at work... not terribly concerned , i have a shortblock at home but im just over this thing - first person to come up with $15.5k can have it & the other shortblock.... due to the fact i was just messing with the coil packs and know the plugs are prob not too clean - im sure its nothing terrible. i just am tired of uckfing with it. someone come get a play toy for the weekends for less than what i just spent upgrading it. Last edited by 06rexLTD; 10-23-2014 at 09:52 AM. 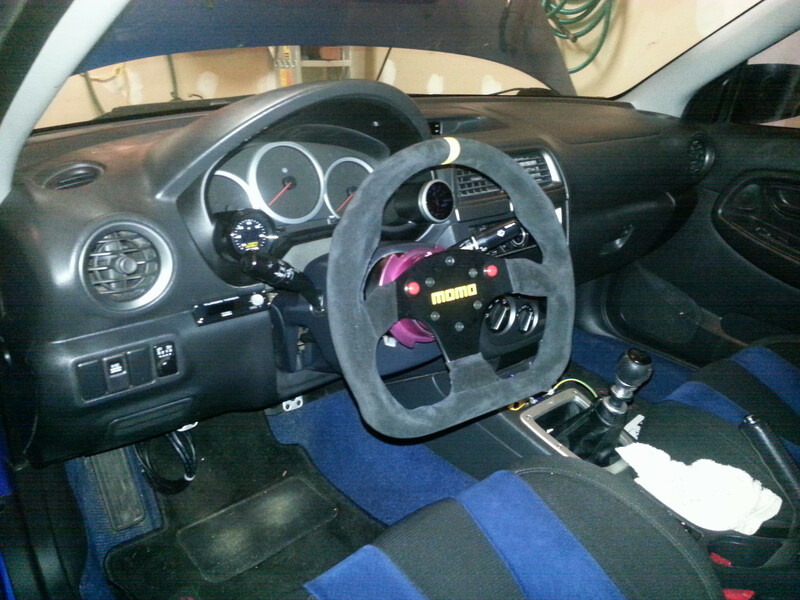 Do you have the stock steering wheel? Are you negotiable on the price? 15.5K is a little high for one with 171K on the clock and isnt running right. Last edited by 06rexLTD; 10-23-2014 at 01:01 PM. i need a RELIABLE dd so if you have something for trade + cash let me know.. im not looking for another project or something needing constant PM to move forward - reliable dailys considered only. Last edited by 06rexLTD; 12-31-2014 at 01:45 PM.